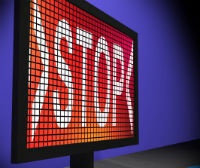 Website blocking has become a hot topic in the UK in recent weeks. Opponents of both voluntary and court-ordered blockades have warned about the potential collateral damage these blocking systems may cause, and they have now been proven right. As it turns out blocked sites can easily exploit the system and add new IP-addresses to Sky's blocklist. As a result TorrentFreak has been rendered inaccessible to the ISP's four million customers. Following a High Court ruling last month, six UK ISPs are required to block subscriber access to the popular TV-torrent site EZTV.it. The actions EZTV faces are not the first taken against a torrent site in the UK. The Pirate Bay, KickassTorrents and several other “pirate” sites have been blocked by previous court orders and remain inaccessible by conventional means. However, over the past couple of days Sky subscribers noticed that the blocklist had been quietly expanded with a new site that’s certainly not covered by any court order – TorrentFreak.com. Our site first became inaccessible on Wednesday night, only to be unblocked 14 hours later. However, about an hour ago it was again added to the blocklist. The recent blocking spree is causing confusion among Sky subscribers who have no idea why TorrentFreak is longer accessible. However, we can confirm that the problem lies with Sky’s filtering software that is supposed to enforce the court-ordered torrent site blockades. 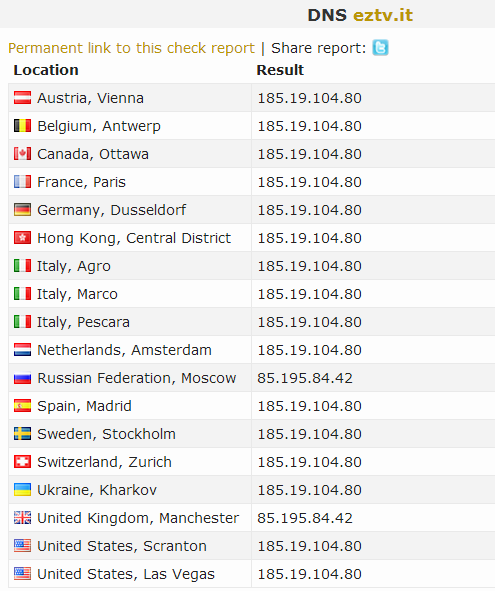 The owner of EZTV informed TorrentFreak that he used Geo DNS to point UK visitors to TorrentFreak’s IP-address. Soon after there were reports that our website had become inaccessible to Sky users. Yesterday afternoon EZTV updated the DNS entries again, now pointing the UK public to some of Facebook’s IP-addresses. The idea was to add Facebook to the piracy blocklist, but nothing happened, perhaps because the DNS pointed to a wide range of IP-addresses. This morning EZTV switched the DNS entries back to TorrentFreak’s IP-address and soon after our site became unavailable to Sky subscribers, as the Twitter reports below clearly confirm. From the above it appears that Sky’s filtering system blocks any and all IP-addresses that EZTV adds to their DNS. This essentially means that EZTV, or any other blocked site, has the power to render entire websites inaccessible to Sky subscribers. Luckily we were the target and not Google. From what we can tell, other UK Internet providers are using different systems as TorrentFreak is still accessible. 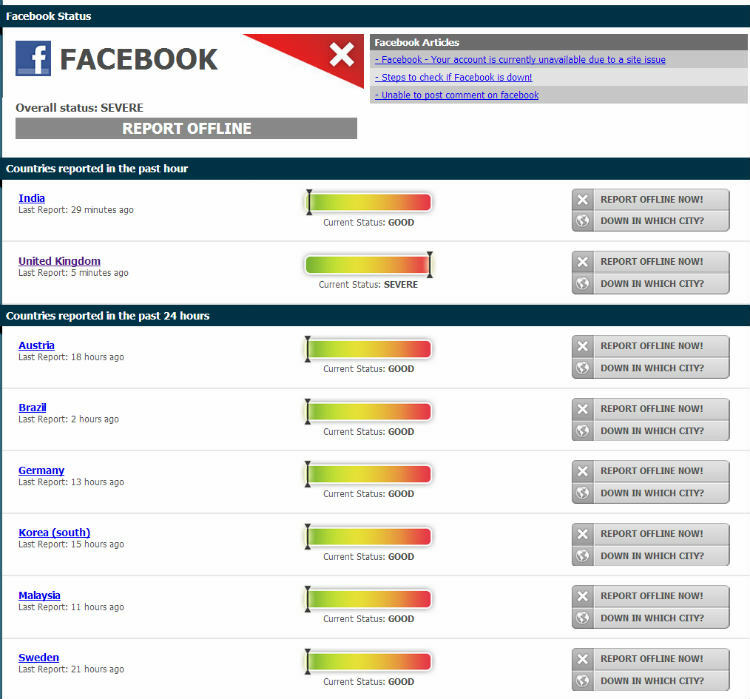 Interestingly enough, Virgin users reported an hour long blackout of Facebook yesterday evening. Whether this is related to EZTV’s DNS entries is unknown at the point, but it’s not common for Facebook to go “down” on a single UK provider. EZTV’s owner tells TorrentFreak that he just wanted to see how the various blocking procedures work at UK ISPs. He never imagined that simply adding a few IP-addresses to EZTV’s DNS zone would take out TorrentFreak. He stresses that there was absolutely no “hacking” involved and alerted us about the plan. It’s expected that after realizing how vulnerable to exploits their blocking system is, Sky will soon correct their mistake. While this may bring TorrentFreak back, this blunder is likely to be used by blocking opponents to show how easily things can go wrong. In the meantime, Sky subscribers will have to use a proxy to access TorrentFreak. Update: Sky isn’t in a hurry to fix the flaw, but EZTV said it will remove the TorrentFreak IP address from its DNS so the site should be accessible again soon. c There are 236 comments. Add yours?